April, Wednesday 27, 1864 Near Wood Ville Ala We drew new Cothes & Caps Boxes Belts & guns Straps & turn over our old ones to day, there is drill of all kin[ds] to day & all hours of the day there is Brigade drill this after noon. 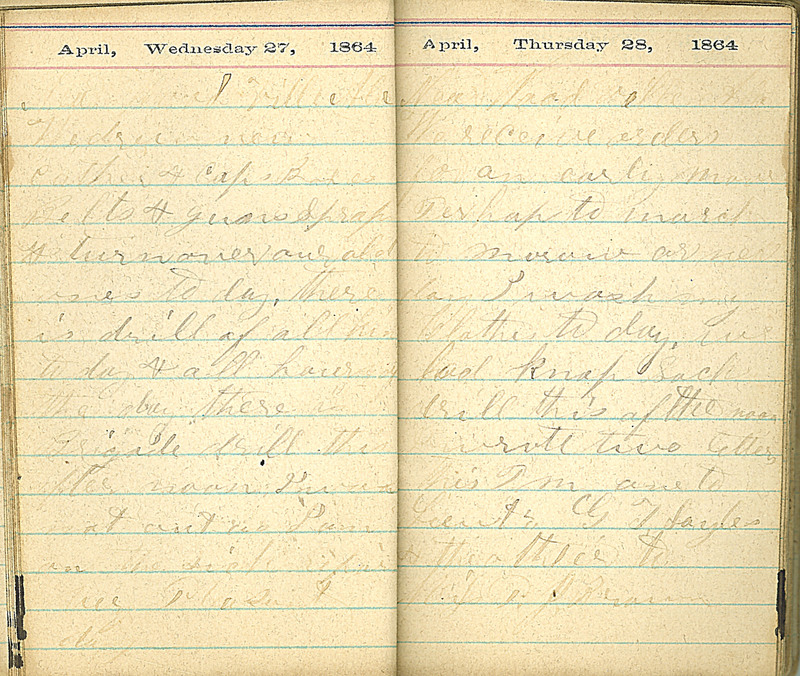 I was not out as I am on the sick report Very Pleasant day April, Thursday 28, 1864 Near Wood Ville Ala We receive orders for an early move Perhaps to march to morrow or next day. I wash my Clothes to day. We had knap Sack drill this after noon. I wrote two letters this P M one to Lieut,, G.T. Sayles & the other to Miss P. J. Brown.